Excited for the week-long events to kick off Thursday, March 9th! For more information about any events, or if you are in search of info about the Imogene Games’ Team information, please call 712-386-2337. Hope to see you in Imogene this week! 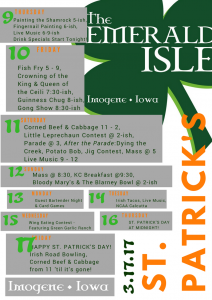 With St. Patrick’s Day falling on a Thursday this year, the Imogene St. Patrick’s Celebration for 2011 is scheduled for the weekend before St. Patrick’s Day. The schedule is as follows: Thursday, March 10th-Painting of the Shamrock & Fingernail Painting. Friday, March 11th-Fish Fry, Gong Show, Open Mic. 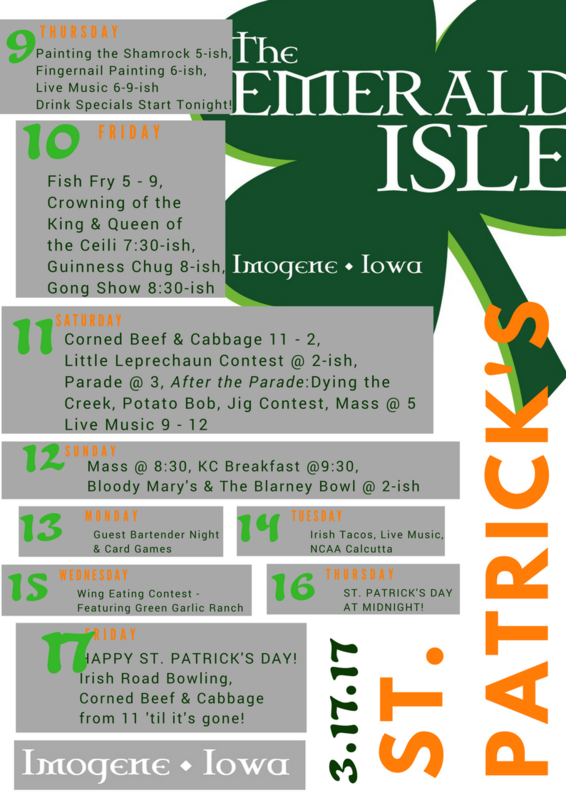 Saturday, March 12th-Corned Beef & Cabbage, Parade, Irish Games, Live Music by Pog Mo Thon. Sunday, March 13th-Blarney Bowl. Monday, March 14th-Closed. Thursday, March 17th-St. Patrick’s Day!!! Corned Beef & Cabbage, Green Beer, Irish Beer Specials. Please check out the poster for more details!!! St. Patrick’s Day is Kind of a Big Deal around here…This year we weren’t quite sure what to expect or how to handle our first year “on the other side” of the bar – but all in all I would have to say it went pretty well. With the Actual St. Patrick’s Day falling on a Wednesday this year, we began the festivities on the Thursday before. The weather did not cooperate, so although we weren’t able to paint the Shamrock in the Street that day, girls of all ages (and a few guys) met to have their fingernails done up in green, glitter, and of course shamrocks, thanks to Angie Jamison. Friday the 12th, as we did every Friday during Lent, we had an all-you-can-eat Fish Fry, followed by the Crowning of the King and Queen of the Ceili (Nick Martin & Linda Laughlin)- then the Gong Show and an Open Mic Session. No rest was to be had that night/Saturday morning, as Darren Bartley from the Classic Cafe in Malvern worked through the night preparing the Corned Beef & Cabbage with Red Potatoes for the next day. We began Saturday with Corned Beef & Cabbage Dinner at 11:00. We tried something new this year – a “Little Leprechaun Contest” where parents were encouraged to bring their children dressed in their most Irish Attire. Then there was the Bicycle Decorating Contest, where we had an amazing number of entries, despite the chilly weather. They then proudly rode their bikes through the Parade, which began at 3:00. Unfortunately, the weather did not allow us to do the traditional dying the creek green, but Steve Martin did figure out a way to still have a makeshift shamrock race. The bobbing for potatoes was the final event before the Irish Rock Band, Pog Mo Thon, arrived to entertain us for the evening. Sunday we were all ready for Blarney Bowl VI, and Imogene’s Fighting Irish prevailed with a win over Tyler Maher’s Omaha Snakes, supervised by proud Blarney Bowl King Chad VanHouten and Queen Tabitha Durfey. We began Wednesday the 17th with finally painting the Shamrock in the middle of Railroad Street. By lunch we were geared back up to serve another round of Corned Beef & Cabbage and Green Beer. Since it was also Wing Night, Jamie created a special Green Jamie Hot sauce for the wings that went over very well. We also began another tradition this year – announcing the 18th of March a community day of rest.